Nigeria on Wednesday announced that a seventh person had died from Ebola and another person was confirmed as having the virus. 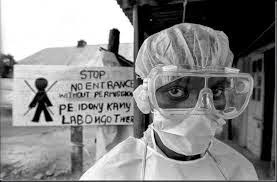 The latest death was a patient at the isolation ward in the oil city of Port Harcourt, where a doctor died on August 22 after treating a Liberian man who had brought the disease into the country. The other five deaths were in the financial capital, Lagos. Four were healthcare workers who had treated the Liberian, who also died. Health ministry spokesman Dan Nwomeh said 18 people, including the deceased, had now been confirmed as having the virus in Nigeria — 14 in Lagos and four in Port Harcourt, 435 kilometres (270 miles) away. The wife of the Port Harcourt doctor who died was being treated at an isolation unit in Lagos, while another case was in a quarantine facility in the oil industry hub. Eight people who contracted the virus have been successfully treated and discharged, Nwomeh said in a series of statements on Twitter. A ninth person, who infected the Port Harcourt doctor, also recovered. A total of 41 people were under surveillance in Lagos and 255 in Port Harcourt. And 320 people have been discharged in Lagos after being under surveillance for 21 days — the virus’ incubation period.